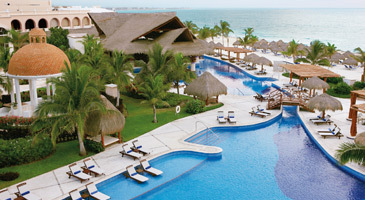 Luxury, 440 rooms, adult-only all-inclusive resort designed to reflect the charm of the Mexican Caribbean. Located on a sugar-white beach south of Cancun near the village of Puerto Morales. Spacious suite accommodations featuring whirlpool baths, 9 gourmet restaurants, an amazing spa offering indoor and outdoor treatments, and state-of-the-art fitness center where guests are pampered and indulged.